Whales, wine trails, snow sports and resorts make winter a cool season in Virginia. Virginia is one of the coolest winter destinations on the East Coast, with mountain resorts, 130 wineries and whale watching getaways that will entice travelers with a passion for wine, snow, luxury and natural wonders. Today the Virginia Tourism Corporation announced some of the best ways to get the most out of a winter trip in Virginia. Winter sports fanatics will get their fill at Virginia's four mountain resorts. 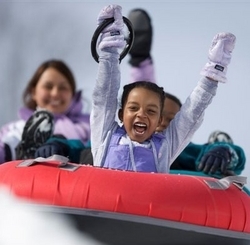 Some of the best skiing, snow boarding and tubing on the East Coast is found in Virginia and each resort offers a unique experience for families and snow sports adventurers. The snow tubing park and indoor water park at Massanutten Resort in the Shenandoah Valley make it a family favorite. Wintergreen Resort in the Blue Ridge Mountains claims the best snowmaking system on the East Coast for great winter sports even when Mother Nature doesn't cooperate. The historic Homestead Resort in Virginia's Allegheny Mountains features snowmobiling, snow shoeing and skiing as part of their winter sports adventures. Bryce Resort, just two hours outside of D.C., has an acclaimed snowsports school making it great for families with beginners. Virginia Beach is a prime whale watching destination in the winter as humpback and fin whales migrate to warmer waters. Virginia Beach's whale watching vacation packages offer a rare opportunity to spot these majestic creatures up close. Come as a family or a group of friends for the thrill of witnessing one of the largest creatures on earth. Top off the aquatic-themed winter adventure with more sea life at the Virginia Aquarium & Marine Science Center and great local seafood restaurants found throughout the city. A weekend trip to Virginia's wineries is a great way to chill out this winter. Virginia is home to more than 130 wineries statewide and was recently named one of the top five up-and-coming wine destinations in the world by Travel Leisure magazine. Winter wine travel in Virginia heats up, literally, with wineries featuring specialty warm mulled wine drinks. Festive winery events pairing Virginia wine with chili and homemade soups heats up the heart and palate of every wine lover. Virginia's numerous wine trails wind through beautiful landscape and connect wineries with B&Bs, historic inns and great restaurants, making wine travel in Virginia easy and fun. Who doesn't need some good old-fashion pampering after the busy holiday season? Wind down and heat things up at one of Virginia's world-class luxury spas and resorts. From the warm water springs of the Homestead, built in 1766 and visited by Thomas Jefferson, to the new Spa of Colonial Williamsburg where treatments are inspired by Powhatan Indian women, many Virginia spas offer a historic take on pampering. Renowned spas including Kingsmill Resort outside of Williamsburg, Lansdowne in Northern Virginia and Boar's Head Inn in Charlottesville feature unique botanical treatments to indulge guests in the ultimate luxurious experience. Great Wolf Lodge, an indoor waterpark resort designed just for families outside of Williamsburg features an Aveda spa for moms who want to escape for an hour or two. Special online packages make winter travel in Virginia a great deal. Check out the Spa, Shopping, Seafood & Sea package in Newport News for a great getaway with the gals. Hunt for treasures in New Market on the Antique Shopping in the Shenandoah Valley package. Get romantic in Casanova with the Poplar Springs Inn Wine Getaway or get treated like a queen with the Royal Relaxation package in Hampton. For a complete list of Virginia winter travel package deals, visit http://www.Virginia.org/winter. For the ultimate deal, visit http://www.Virginia.org/winter to enter the Virginia Winter Fun Pick Your Passion Sweepstakes. Register by January 11, 2008 for a chance to win the grand prize and choose from the following four prize packages: Hot Winter Fun and Wine Getaway for two at Wintergreen Resort, a Romantic Spa Getaway for two at the Homestead Resort, a Family Fun Package for four at Massanutten Resort or a Whale Watching Getaway for four in Virginia Beach. All prizes include economy airline tickets, rental car, accommodations and package activities. Visit http://www.Virginia.org/winter to start planning the perfect winter trip in Virginia.